Parallel to the development of domestic high-speed rail, the Chinese government and rail enterprises are actively seeking customers overseas. In a meeting with a trade ministers from the Association of South East Asian Nations (ASEAN) last week, Premier Li Keqiang thanked them for traveling by high-speed train from south China to Beijing, calling it a real "roadshow" for Chinese high-speed trains. Thailand, an ASEAN member, plans a high-speed rail network in the next seven years to satisfy its business and tourism demands. On a state visit to Thailand in early October, Li pushed China's willingness to participate in the project, stressing that "railway cooperation can become a new highlight in China-Thailand cooperation". 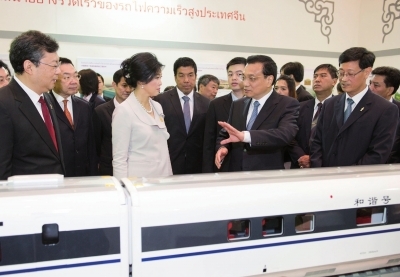 An exhibition of Chinese high-speed rail also kicked off in Bangkok during his visit. Not only Thailand, countries including the United States, Russia, Malaysia, Singapore, Brazil and Turkey are mooting their own high-speed rail projects. The Australian government has completed a feasibility study into a proposed high-speed rail route along its east coast. With the world's longest operational line for bullet trains that run at more than 200 km per hour, China wants to take part in projects overseas. "China's high-speed railway is advanced in technology, safe and reliable, and has a cost advantage," Premier Li told Australian Governor-General Quentin Bryce in a meeting in Beijing in mid-October. Zhou Li, a senior director at China Railway Corporation, said China had learned by absorbing technology from various countries to create its own technology. By the end of September, China had nearly 10,000 km of high-speed railway lines in operation and had solved technical challenges on various complex geographical problems. History of high-speed rail in China is not long. The first line, linking Beijing and the neighboring port city of Tianjin, was inaugurated in August 2008. On July 23, 2011, 40 people died when a high-speed train hit a stationary train near Wenzhou, casting a shadow over high-speed railways and leading to a nationwide safety check and stagnation of construction. Last year, China cautiously resumed construction, culminating in the Beijing-Guangzhou link, the longest of its kind in the world. Wang Mengshu, a member of the Chinese Academy of Engineering and a railway expert, said China stepped up railway system management after the 2011 accident, sticking to construction schedules which guaranteed safety. "High-speed rail now has a more solid foundation." Wang said. With public confidence recovering, the comfortable cabins and punctuality of the trains have made it an enormously popular way of travel. Passenger volume on the Beijing-Shanghai line rose 40 percent during the second year of operations. Thanks to the domestic success, production and construction on a large scale has lowered costs to about 200 million yuan (33 million U.S. dollars) per km, more competitive than Japan, UK and Germany, according to Wang Mengshu. Last week, the state-owned train maker, CSR, announced an Italian order meaning Chinese high-speed rail core components are making their way into the European market. China should become a high-speed train supplier on a more comprehensive level, exporting not only equipment, but also technology and Chinese railway standards, Wang said. Li Hongchang, railway expert and economics professor from Beijing Jiaotong University, said high-speed rail "going abroad" is anything but simple. It involves juggling trade, finance and energy concerns and requires efforts from governments on both sides, Li said.